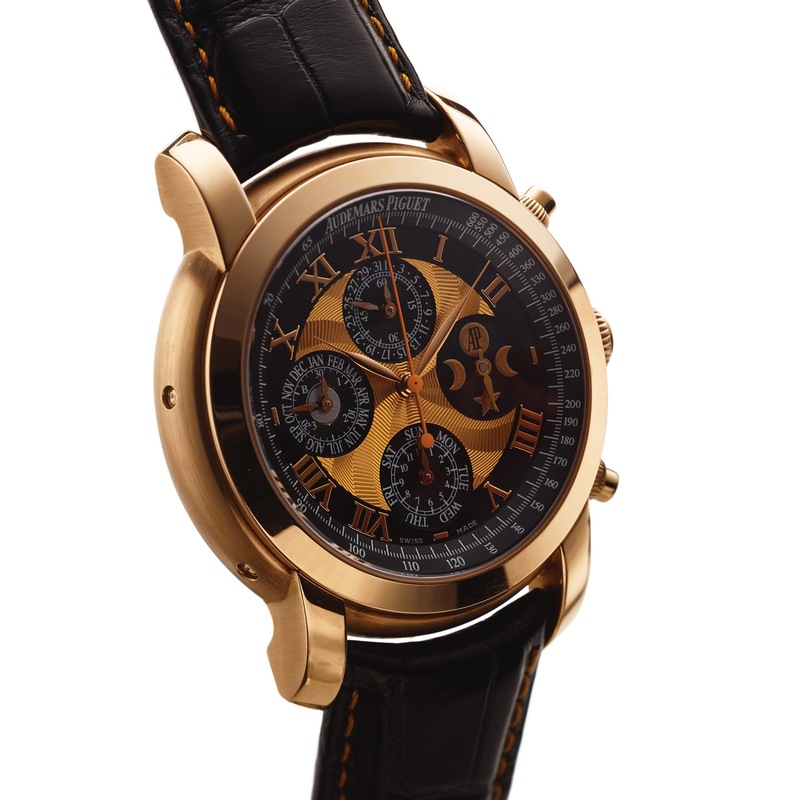 AUDEMARS PIGUET ARNOLD'S ALL STARS LIMITED EDITION PERPETUAL CALENDAR CHRONOGRAPH PINK GOLD Audemars Piguet, Genève, "Arnold's All-Stars After-School Adventures," Limited Edition, Dual Time, Automatic, Chronograph, Perpetual Calendar, case No. F95453, Ref. 26094. Made in a limited edition of 100 pieces in 2007. Very fine and rare, self-winding, water-resistant, two time zone, 18K pink gold wristwatch with perpetual calendar, round button chronograph, phases of the moon, tachometer and an 18K pink gold Audemars Piguet deployant clasp. Accompanied by the warranty and instruction booklet. Three-body, polished and brushed, case back with 6 screws and engraved: "Arnold's All-Stars After-School Adventures," straight curved lugs, sapphire crystal. Bicolor guilloche copper and matte black with applied pink gold radial Roman numerals, subsidiary dials for the second time zone and weekdays at 6, 30-minute register and months at 9, the days of the month and seconds at 12, the phases of the moon at 3. Pink gold feuille hands. Cal. 2326, rhodium-plated, fausses cotes decoration, 54 jewels, straight-line lever escapement, monometallic balance, shock absorber, self-compensating flat balance spring. C. Three-body, polished and brushed, case back with 6 screws and engraved: "Arnold's All-Stars After-School Adventures," straight curved lugs, sapphire crystal. D. Bicolor guilloche copper and matte black with applied pink gold radial Roman numerals, subsidiary dials for the second time zone and weekdays at 6, 30-minute register and months at 9, the days of the month and seconds at 12, the phases of the moon at 3. Pink gold feuille hands. M. Cal. 2326, rhodium-plated, fausses cotes decoration, 54 jewels, straight-line lever escapement, monometallic balance, shock absorber, self-compensating flat balance spring. Dial, case and movement signed. DIAM. 43 mm. THICKNESS 14 mm. Produced in a limited edition of only 100 examples in pink gold, the AUDEMARS PIGUET / ARNOLD SCHWARZENEGGER collaboration ARNOLD'S ALL-STARS model was a joint venture for the benefit of the AFTER-SCHOOL ALL-STARS (ASAS) charity that provides comprehensive after-school programs that keep children safe and help them succeed in school and life.